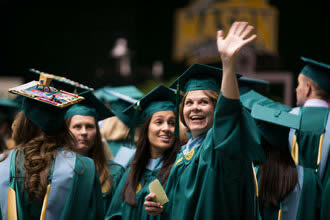 George Mason University’s graduate program in Special Education is highly regarded for its academic and research achievements as well as for offering a broad range of licensure and certificate programs. Academic offerings include teaching students with disabilities who access the general curriculum, teaching students with disabilities who access the adapted curriculum, teaching students with visual impairments, applied behavior analysis, assistive technology, autism, and special education leadership. It is one of the largest special education graduate programs in the country and is in the process of expanding its undergraduate offerings. The division receives National Recognition from the Council for Exceptional Children (CEC) for all of its programs. The program is also distinguished by its extensive services to families and educators throughout Virginia, for its innovative model programs offered through the Helen A. Kellar Institute for Human disAbilities, and for the first-of-its-kind Mason LIFE program that welcomes college-aged students with intellectual disabilities to live and study on campus. More than 170 division employees support three licensure programs and four certificate programs, which serve approximately 675 students as well as activities from over $9 million annually in funded projects. The mission, “to improve the lives, productivity, and education of persons with disabilities” drives the goals and objectives of the division. The Kellar Institute for Human disAbilities supports numerous educational research projects. For more information about our programs, please visit the College of Education and Human Development Special Education website. For more information about the Kellar Institute, click here.